FILE - The salt lake is seen in Uyuni, Potosi, Bolivia, Nov. 6, 2012. 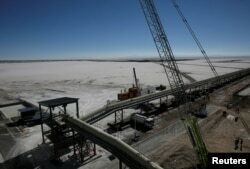 When Germany signed a deal last month to help Bolivia exploit its huge lithium reserves, it hailed the venture as a deepening of economic ties with the South American country. But it also gives Germany entry into the new "Great Game," in which big powers like China are jostling across the globe for access to the prized electric battery metal. FILE - A view of a portion of an industrial plant in Llipi on the salt lake of Uyuni, Potosi, Bolivia, Oct. 7, 2018. The German push included a series of visits by German government officials who talked up the benefits of picking a German company. Bolivian officials also toured German battery factories, Bolivia's deputy minister of High Energy Technologies, Luis Alberto Echazu, told Reuters. ACI's win means Germany now has a foothold in the final frontier of South America's so-called Lithium Triangle: the Uyuni salt flat in Bolivia, one of the world's largest untapped deposits. The triangle comprises lithium deposits in an area that includes parts of Chile, Argentina and Bolivia. 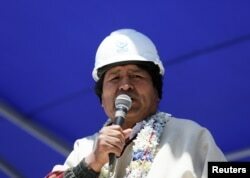 FILE - Bolivia's President Evo Morales speaks on the salt lake of Uyuni, Potosi, Bolivia, Oct. 7, 2018. In addition, unlike Chile's sun-drenched Atacama salt flats, snow and rain slow the evaporation process needed to extract lithium from brine in Uyuni, and the landlocked nation will have to use a port in neighboring Chile or Peru to ship the metal out. 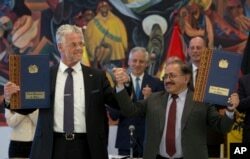 FILE - ACI Systems GmbH's President Wolfgang Schmutz from Germany, left, and manager of state company of Yacimientos Boliviano de Litio, Juan Carlos Montenegro, pose for photos during a signing ceremony in government palace in La Paz, Bolivia, Oct. 5, 2018. None of Germany's top three carmakers — BMW, VW or Daimler — confirmed any agreement with ACI when contacted by Reuters. BMW said it was in preliminary talks with ACI but had made no decision. VW said ensuring supplies and stable prices for raw materials was important, but noted lithium production in Bolivia was particularly demanding. Daimler board member Ola Kaellenius said: "If it's happening, we're not part of it." FILE - A storage unit is seen at an industrial plant in Llipi on the salt lake of Uyuni, Potosi, Bolivia, Oct. 7, 2018. 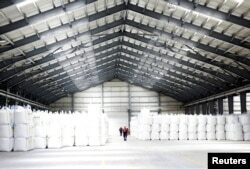 ACI has said it expects the lithium hydroxide plant to have an annual production capacity of 35,000-40,000 tons by the end of 2022, similar in output to plants operated by the world's top lithium producers. Eighty percent of that would be exported to Germany. ACI's willingness to build a battery plant in Bolivia helped to seal the deal, said Echazu, the deputy minister. China's embassy in La Paz declined to comment on the Uyuni project, but said the potential for future cooperation with Bolivia on lithium was "huge." "We don't want a single country to set the rules, we want balance and other world powers must help create that balance," he said. "So for Bolivia, it's important to have not just economic partners for markets, but geopolitical strategic partners." "China-Bolivia relations are still good. China is present in every country in the world and impossible to avoid," he said.